Citation: Vieru D. A commentary on: "Nomograma of a landfill (MSW)-setting m parameter values". J Env Chem Toxicol. 2018;2(1):20-22. • Industrial wastes (MSW) together with the wastes from medical sector have also an important potential for greenhouse effect. It is already known that the greenhouse effect gases (6 identified gas types were identified) are dangerous for the global atmosphere heating, among them CH4 is the most dangerous one. CH4 present a special attraction for investors, in the same time, because of its economic value [1-3]. The article: “NOMOGRAMA of a landfill (MSW)—Setting m Parameter Values” presents the analytical way for “m” parameter setting values. This equation is the result of the following judgment: if 7 accumulate at 3 times the time of stationing a quantity of municipal waste (MSW) on a site, the same result is obtained when a time (expressed in months -m-) of number 13 is obtained . In such a way any quantity of the landfill waste deposited (MSW), conforming or non- conforming, can be approached by using the prior mathematical equation presented. With regarding to the MSW waste degrading the information offered by the solution of the equation is incorrect . 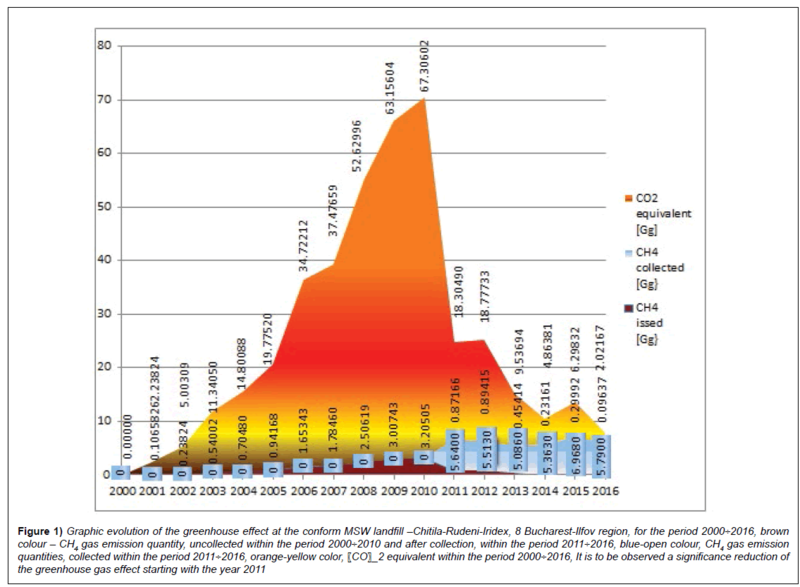 The MSW waste degrading means the moment when the DOC (dissolved organic carbon) phase is reached and CH4 together with other greenhouse gas emissions are present. M ϵ [7,18] or 7 ≤ m ≤ 18. At an MSW landfill the waste depositing is happening within a calendaristic year, AC (which starts at 01.01 and ends at 31.12). The calculus year, AT related to the estimation of gas emission, is smaller with 6 months than AC (international community accepted that the waste deposited within last 6 months of the AC -31.07 ÷ 31.12- remains undegraded or with an incipient one. The equation of the 2nd year calculation n =2, is 19t+7=37-t, etc. • The person who is in charge for setting up NOMGRAMA of an MSW landfill has to have enough experience in the waste management field. If a computer software it will be used, there is the possibility to have a blockage it in waste management and to say that “the approaching of NOMOGRAMA setting up values is wrong”. The m values established at the calculus year-AT have no connection with waste depositing quantities. The quantities of landfill MSW waste degraded which leads to the CH4 gas emissions are generated by the m values, at the calculus year AC. From this reason it is absolutely necessary to know the annual MSW deposited quantities. The collecting CH4 MSW deposits have to share the information to the environment authority, annually . For the CH4 gas emission calculation period belonging to the calculation year 1 – AT1 and the year 8-AT8, the m parameter establishing relation is: , known as the Vieru 1 relation. • 7- a natural number which means: if 7 accumulate at 3 times the time of stationing a quantity of municipal waste (MSW) on a site, the same result is obtained when a time (expressed in months -m-) of number (12n+13) is obtained). • , known as Vieru 2 relation. • Approximately approximates the value of m to the year of calculation. 7- 7- a natural number which means: if 7 accumulate at 3 times the time of stationing a quantity of municipal waste (MSW) on a site, the same result is obtained when a time (expressed in months -m-) of number ((12n)+13) is obtained. The established calculus relation can be applied to all conform or nonconform MSW landfill deposits to capacity >10 Gg/year. Usually the lifetime of a landfill MSW deposit not exceed 30 years. After MSW landfill waste depositing is over, the CH4 gas emission is decreasing and quits after 25 ÷ 30 years. In this case the calendaristic year-AC–is identical with the calculus year, AT, e.g. AC=AT. • Investments within the friendly environment waste management condition will lead to new job opportunities . Collection of the CH4 gas emissions, on site, for MSW landfill deposits will lead to an annually reducing of the greenhouse gas effect with a percentage of 1 ÷ 2%. This aspect will have, as a consequence, an environmental temperature reducing by minimum 1°C. Increasing of CH4 gas emission as an energetically resource, it is to be noticed, also. It is clear that the Vieru’s (1,2) application method for the estimation of the CH4 quantity from the Romanian MSW landfill waste deposits, conforming or nonconforming, should be an important alternative among the existing calculus relations already, on international level too. It is to be noted that MSW deposited quantities are absolutely necessary to be known, as a common factor but the approach way has to be as follows: time, expressed in months-m- is the factor which have a decisive contribution to the MSW wastes degradation up to the DOC (dissolved organic carbon) phase. Another example of the Vieru’s (1,2) method application related to the CH4 gas emission calculation is given in the Figure 1. In Table 1 the msw Chitila-Rudeni-Iridex (8 Environmental region Bucharest- Ilfov) conform deposit NOMOGRAM for the period 2000 ÷ 2016, is presented. Vieru D. Nomograma of a landfill (MSW)—setting m parameter values. Atmos Clim Sci. 2017;7:436-54. Vieru D. A new approach method of CH4 emission estimation from landfills. 2017. Mihoc G. Small mathematics encyclopedia. Technical Publishing House, Bucharest. 1980;93. KYOTO Protocol, Convention on Climate Change, Entered into Force on February, 2005, UNFCCC. 1997. The Doha Amendment Adopted at Doha on 8 December 2012, of the Kyoto Protocol to the United Nations Framework Convention on Climate Change Adopted on 11 December 1997. 2012. UN Conference on Climate Change in Paris. 2015. Council Directive. Landfill of Waste. 1999. Voicu G. The ecological solid waste depositing engineering. Politechnica Press Publishing, Bucharest Romania. 2016. Liu Y, Xing P, Liu J. Environmental performance evaluation of different municipal solid waste management scenarios in China. Key Laboratory for Solid Waste Management and Environment Safety, Ministry of Education of China, School of Environment. 2017.